Foodie Call #7 took place on Saturday, April 10, 2010. 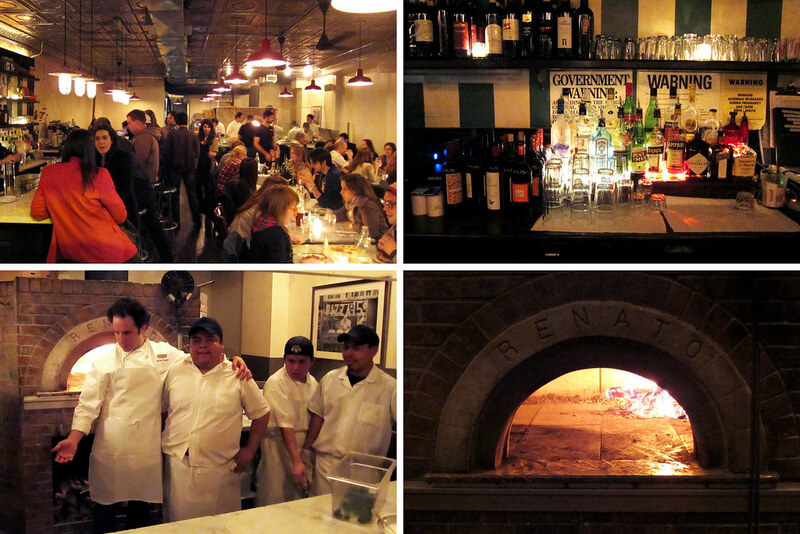 For the second straight time, Kate and Gary found themselves in Williamsburg, this time with friends, to enjoy the Neopolitan pizza at Motorino. Kate: Full disclosure: another reason we found ourselves in Williamsburg is that I had sort of already checked out the East Village location. And by checked out I mean gone there a week before I had planned to go with Gary, and stuffed myself silly with pizza. Like that friend who promises to save a movie to see with you and then goes and sees it with someone else, I totally cheated on Gary. What can I say? I had worked a harrowing 9 hour shift, it was rainy and cold outside, BF offered to take me anywhere I wanted for dinner and all I wanted that day was pizza. And if I was having pizza, it may as well be the best pizza in New York City. The lauding words of Sam Sifton were echoing in my ear, and Motorino it was. It was delicious. But more on that later. So anyway, after I broke the news to Gary (who took it reasonably well “Oh. Well, that’s okay, really it is. I mean, I’d never do that to you or anything but . . . really, it’s fine.”), I promised that it would not interfere with our scheduled foodie call, and that we would simply venture out to the Willliamsburg location to keep it fresh for me and also because Sifton had proclaimed it the much more comfortable location. This turned out to be true. At the Manhattan space, BF and I were seated so close to the next table that we could hear their breathing, and getting up to go to the bathroom was an ordeal. Nothing new for New York, but if it can be avoided, all the better. Gary: Alright, I’m not really angry about dear Kate getting some Motorino action before I got some – after all, I’ll just have to return the favor some day. Besides, she did go to the East Village location, leaving Williamsburg a maiden voyage for all of us. But then we had a change of plans – EV instead of Billyburg for some ungodly reason. Like it hardly mattered since the line was out the door at the EV location. Thankfully, we were a short walk and three stops on the L away from the Williamsburg location. Kate: My fault (again!) for making a last minute decision to go to the East Village location. We got a later start than originally planned and I didn’t feel like trekking out to Williamsburg, the Graham Avenue stop no less! “I know myself,” I thought. I’m gonna stuff myself silly with pizza, drink far too much wine, then not want to face the subway back to Park Slope, and blow $40 on a cab.” Besides, there was no wait when I went last week (on a Tuesday at 9 P.M.), so how bad could it possibly be (on a Saturday, at 9 P.M.)? Duh. So I dragged the boys across town on foot from the West Village to the East. As we approached I inwardly groaned. There was a mob outside big enough to fill the tiny restaurant three times over. And they were just waiting to put their names in. Off to Williamsburg it was. With a quickness. We were hungry. The L of course was ridiculously fast and within minutes we were off the L looking around and trying to get our bearings. It’s not the Bedford Avenue stop that I know so well. After whipping out our smartphones we felt like fools. There it was. Conveniently located less than a block from the train. We entered and were hit with the comforting glow of the oven in the back, a smiling hostess, and a semi-bustling bar area. After being told it was a 30 minute wait, we took a load off at a couple of the bar seats that had opened up and perused the drink menu and the scene. The space is far larger than its cousin and much more comfortable, just as Sam had promised. We ordered drinks (beers for the boys, a delicious cocktail with Campari, Italian orange soda, and gin for me). Normally I stick with beer and wine with pizza but I figured I should try one of these cocktails since everything on the list sounded amazing– not too cloying or too complicated like much out there right now, and the East Village location does not serve liquor, so I indulged in the name of research. I was so glad I did. The stress of the East Village false start lessened with each not too sweet and terribly refreshing sip. Ah. Suddenly (okay, after about 25 minutes of waiting at the bar) we were sat at a table near the oven. Gary: To start, we ordered two salads. 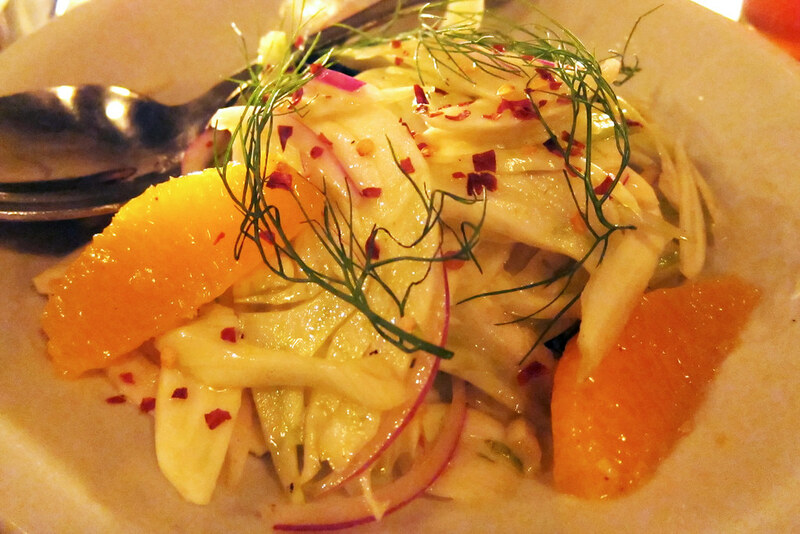 For the seafood eaters among us – that’s JP, BF, and myself – we all had a taste of the Octopus Salad. 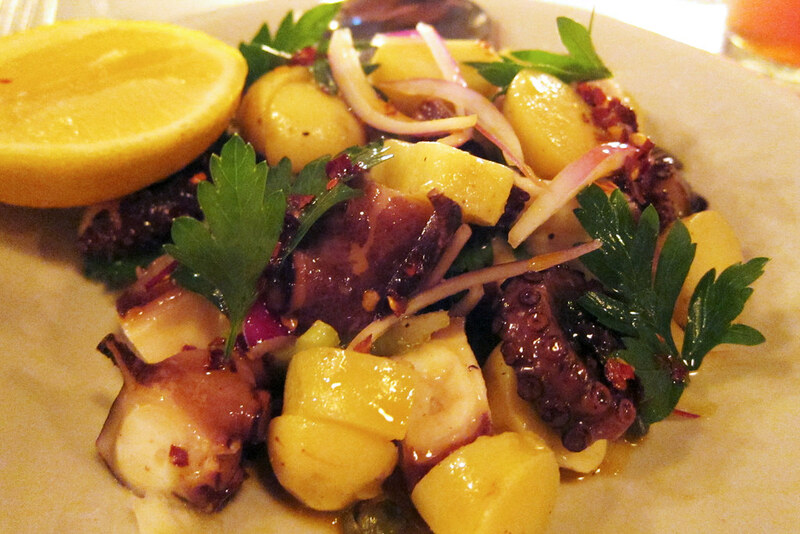 It’s a warm salad that has octopus and fingerling potatoes, plenty of heat from red pepper flakes, and some really nice tartness from capers. A little squirt of lemon married all the flavors together – a very light, flavorful start to our meal. Kate: Fresh, light, herbaceous and citrusy. A straightforward little snack. Very nice. 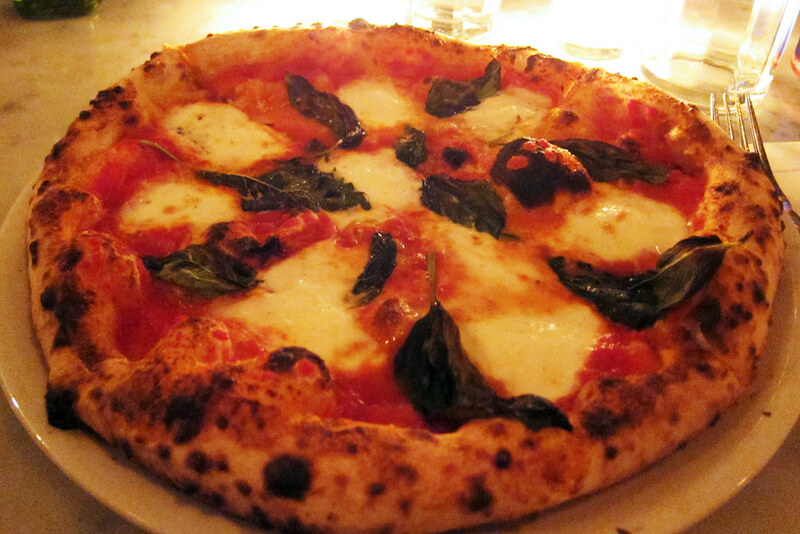 Gary: At any pizzeria, I have to get a margherita as a “control” pizza – it’s something you’ll find at just about any pizza joint and if they can’t even get this staple right, it could auger badly for the remainder of the pies. No such problem for the Margherita DOC – the combination of mozzarella di bufala, tomato, and basil is a winner at Motorino. The best part was the crisp yet chewy crust that was able to handle the wet tomato sauce without wilting. So good was this crust that we were all swishing it through their house olive oil and salt when we got to the outer edges. Kate: I was in heaven. As I had already had the DOC in the East Village, I knew to order it again. This one was even better. The one at the other location was very droopy in the middle. It was still awesome, but not exactly what they were going for. This one was perfect. Thin in the middle, pillowing out to one of the best crusts I’ve had. Kate: This pie grew on us. BF and I were splitting the two, and at first I thought I should try and muneuver to get the larger slices of the Margarita. After finishing my first Stracciatella slice though, I knew enough to grab another one of those. The flavor of the cheese and the crust was simple and addicting. The flavor of the cheese was mild and the texture hearty without being too rich. I gave Gary half of one of those to try and he gifted me back with a half of a Margherita to keep things even. I was chewing chewing chewing, plowing my way through the pies, doing my best to keep up and wondering why it was taking so long when the boys seemed ahead of me when BF tactfully pointed out that in the confusion of trading slices, I ended up eating four and a half slices while BF was left with only three and a half. Keep in mind that these “personal” pies can be finished by one person, but one will leave very full. I blame the gin cocktail for making everything fuzzy. I regretted my confused gluttony later as I waddled out, but at the time, I was in heaven. I think I also earned the awed respect of Gary and JP for eating the boys under the table. Gary: I was absolutely astonished at how much Kate could eat that night. The mere thought of it actually makes me a little sick. Gary: The Soppressata Picante – again, something just for the meat eaters (just JP and myself, this time). 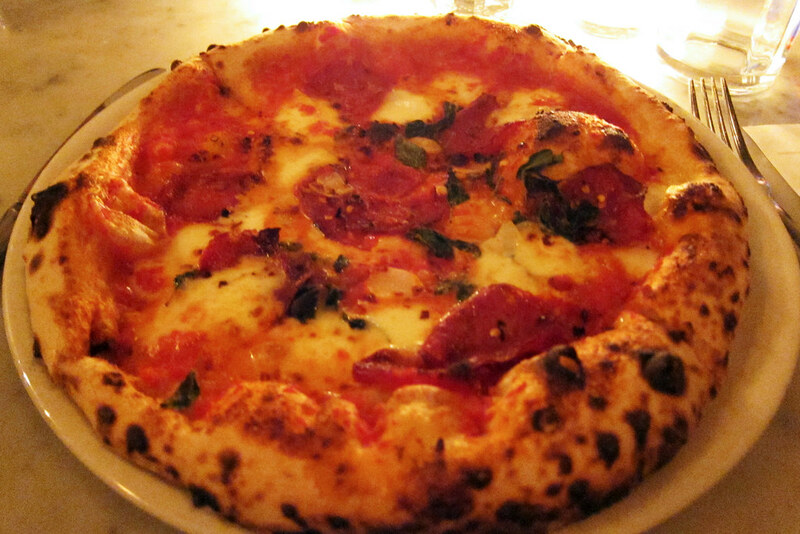 Think of a soppressata pizza as a better tasting pepperoni pizza. It’s got thin slices of spicy, cured sausage on top of fresh mozzarella and tomato sauce. As if the soppressata weren’t spicy enough, there’s also fresh chiles in this pie. You might end up with heartburn when you finish it but it tastes so good, it might be worth it. Well, maybe; it all depends on your stomach! Kate: So all this time, eating and chatting by the warm glow of the oven, I barely noticed the service. That’s to say, I didn’t have to. Our server was perfectly attentive, the food came out with alacrity and accuracy, our waters were never less than half full, our beers replenished before they reached the bottom, we wanted for nothing. We were also given ample time to linger without being rushed out, and the manager even came over after our meal and asked us how everything was. We of course expressed our happiness. “This must just be the way folks are off the Graham stop on the L,” I thought happily, warmly, drunkenly, not really thinking anything of it. It wasn’t until we were outside walking to the train (the train stop is so very close to the restaurant that I pleasantly surprised myself and wasn’t even tempted to take a cab), that JP thoughtfully inquired if we had noticed anything special about the service. “They were really great, weren’t they?” I offered up obviously. I was starting to get JP’s drift. That hadn’t been an ordinary dining experience. “Maybe they saw us taking pictures?” I wondered. As we were sipping our drinks at the bar I asked BF to take an exterior shot of the restaurant. As he did, the hostess, standing close to the open door, approached him and told us our table would be ready soon. She eyed the camera. “Are you food writers or something?” she asked. “Yes. Well, they are.” BF innocently replied, gesturing to us. So that explained it. I laughed out loud that BF would let the poor staff at Motorino fall all over us when little did they know, Foodie Call isn’t exactly the most read food blog in town. But maybe why would they go to such trouble to keep any food bloggers happy or even reviewers for that matter? They’ve already been named best pizza in the city by the New York Times, after all, and they aren’t exactly hurting for business. The answer I guess is what makes the place so great. They’re not content to rest on their laurels but constantly striving to be the best. Just one of the many things that sets Motorino apart from all the others. 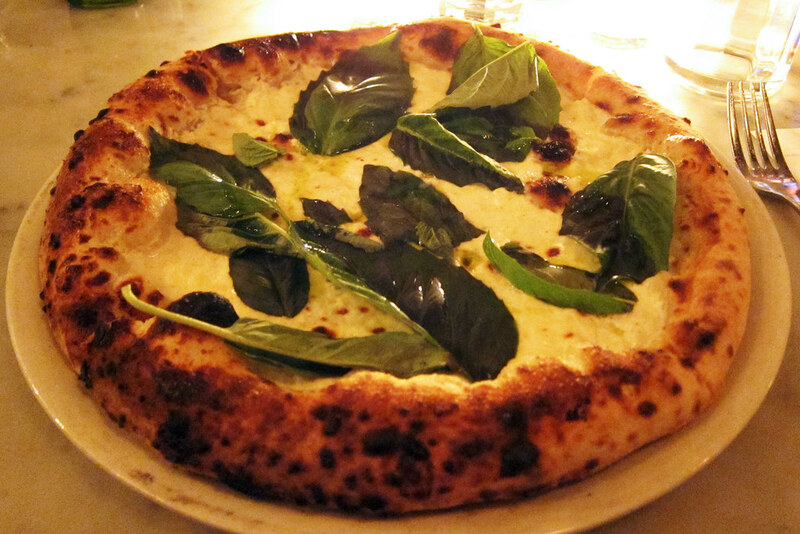 Gary: There’s not much to say that we (and many others) haven’t already said – Motorino makes some of the best Neopolitan pizza in New York City, heck maybe even the entire country. Plenty of skill goes into making a perfect pizza dough and then making sure it comes out the right way in the oven while much consideration goes into the right combination of flavors for toppings, both of which are things Motorino has in spades. Also, be sure to look at the chalkboard across from the bar because they’ll have special seasonal pizzas and salads listed there. They can be hit or miss (good but not as good as the regular pizzas) but at least they’re always searching for something new to put on their dough, the one thing that’s always consistently great. Motorino. 319 Graham Avenue, Brooklyn, NY 11211. [Show/Hide Map] (718) 599-8899. So true, great write up guys. The pizza here absolutely rocks. Great pictures! I actually live right next door (literally) to the E. Vil location so have the good fortune of dropping my name on the wait list and having the hostess ring my cell to come downstairs when a table opens up. So true though that it is a TIGHT fit for sure. BTW, how cute of you to link your name to your post on Brooklyn Kitchen. That’s quite the memory you have!